Posted by sneaks in display topics, great ideas, J non-fiction. The Library of Congress has placed 3000 images from its renowned photo archive on Flickr, the photo sharing web site. These images come complete with attribution, title, date, medium and format, rights info, call number, and LC subject headings. Wow. 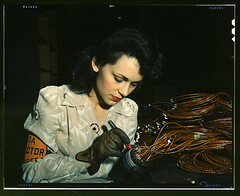 The collection currently features news archive photos, images of rural life from the Farm Security Administration, and photos of WWII mobilization such as the one featured above. LC invites comment and tagging by Flickr users, making this an interesting experiment in folksonomies as well as a valuable educational resource. Now, in addition to pointing kids to the non-fiction books they need for their history reports, we can show them how to find appropriate pictures on Flickr.